Having been free of world war for over 66 years, it’s understandable why some of the younger generations have sometimes taken our peaceful existence and secure lifestyle for granted. But back in 1945 the world was a very different place and even the life of a school boy was exciting. Here is a story from my father about his life boarding at school in Victoria, Australia in 1944 and 1945. Dad was a little apprehensive in putting his story to paper, but having read it, I think its a treasure and I’ve convinced Dad that others would enjoy reading it too. I hope you agree. Dad’s account below adds a “back story” to accompany the story at “QF32” page 9. Update October 2014. Defying the laws of mortals, Dad again passes a gruelling 10 minute treadmill challenge as part of the medical for his licence renewal. 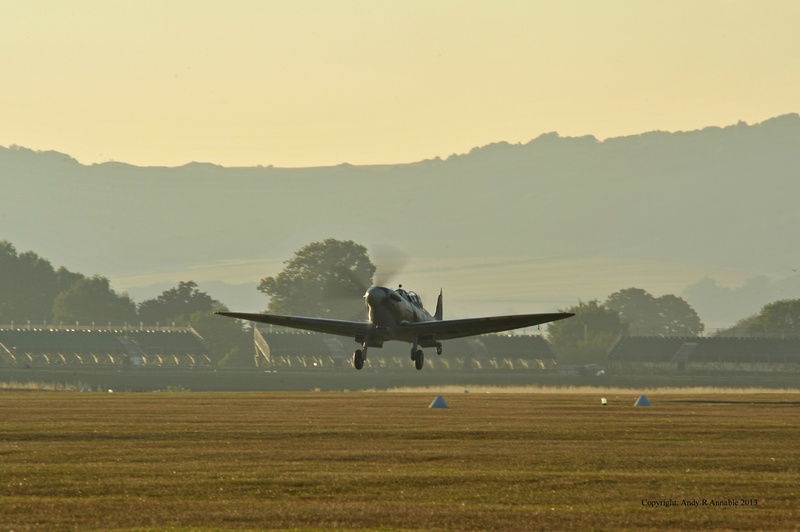 Another Spitfire flight is on the calendar for September 2015. In 1943 there was a lot of activity at Lara Airfield (about 5 kms from School (Geelong Grammar).) and at times, during daylight or night, the RAAF Base at Point Cook would use the Lara field for Aircrew training using Airspeed Oxfords, (a twin engine trainer with retractable undercarriage). It was fun watching the skies for the arrival at dusk of the aircraft from Point Cook, where they were based. Most nights there would be at least ten, arriving one behind the other. The flight training would consist of circuits and bumps (landings) and this would continue throughout the night before returning to Point Cook. With a friend, we would make plans to go flying in the aircraft during the night. The plan started with secretly getting out of the dorm about an hour after lights off, getting our bikes out of the bike shed and riding off into the darkness towards the field. Plans could go wrong, as it did for me one night when, in pitch darkness, I suddenly realised that my handlebars had come adrift from the bike. The uncontrolled crash that followed, left me on the ground uninjured. On arriving at the field we would proceed to the point where the aircraft were stopping to do their take-off checks. We had to quickly dash to the rear of the aircraft, open the rear door and jump in, and then introduce our presence to the startled Pilot as he prepared for take off. The conversation would go like this: “Hi Officer! Can we come flying with you? We will sit on the spar and won’t say a word. ?” The Pilot always said OK, and so off we would go, round and round, flying over the school below (where all should be asleep) with a Pilot for all we knew could be doing his first solo night flight. After an hour or so of flying circuits, we would jump out of the rear door, collect our bikes, and head off home to school, where the real challenge of getting back undetected into the dorm lay ahead. The night watchman was a real danger. I am delighted to say on the occasions we did our night flying, we never got caught, and we never crashed. We never considered the risk, and why should we? There was a war on!! What a line up.Difficult to get decent photo as the base was operated by the Americans who had a sign stating anybody found near the aircraft would be shot.!!! Featured three Kittyhawkes,One Aerocobra and one hard to see Brewster Buffalo. One Saturday, I noticed a lot of flying activity at the Lara Field and decided to try and do a little daylight flying. 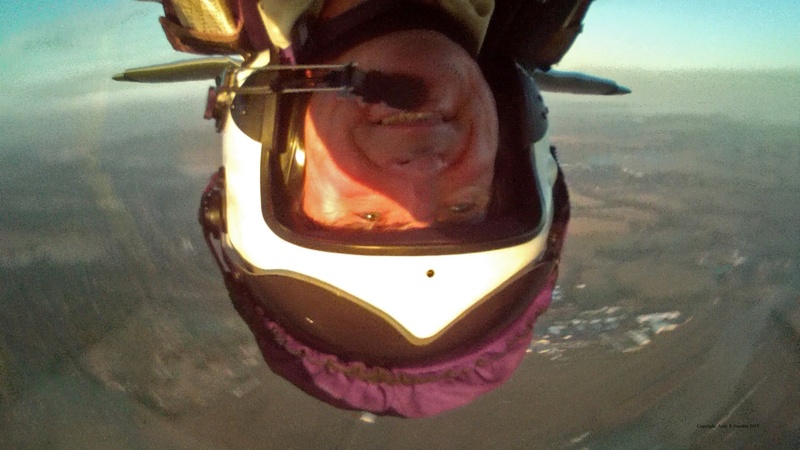 I was keen to do some cross country flying, which they did at a very low level. So off I went on my bike, then on arrival jumped into the back of the Airspeed Oxford, asked the usual question, and was told much to my delight, that they were leaving on a cross country flight which would take them to Skipton ,(a small township in the Western District) and that the flight would take about 90 minutes and that yes,I could come provided I sat on the span and that I must hang on. Our flight level would be at 200 feet (tree-top stuff!). It was a great day and a great flight. Airspeed Oxford No 309.Its hard to see the entrance door that we used to hop thru to get on board.It’s roughly where the insignia is.Not very big,and we had to be quick.Wouldn’t-want to be half in when they started their take off roll!!! At about this time I became aware that there was a lot of aviation interest at the International Harvester Works, Corio. I rode my bike past the Corio Whisky Works and was delighted to see a number of Kittyhawk, Aerocobra and Buffalo Aircraft, parked on the open field leading up to the main Geelong to Melbourne railway line. All fighter aircraft were obviously being assembled at the Works and then flown out for active service. On closer examination it was obvious that no contact could be made here. The area was full of US security guards all equipped with rifles and ready to shoot any intruder. I left but was able to secure a few photographs of the planes, which I enjoyed sharing with my school friends. Real dangerous shot. We were close up. Three Kittyhawkes. Beautiful!!! To my delight a short time later, the US forces packed up and left the camp, which was then taken over and occupied by the RAAF for the purpose of assembling wonderful British-made Spitfires, Airspeed Oxfords ,and Avro Ansons. Sheer heaven! Unbelievable!! What an opportunity! And so I decided that a front-on approach was the best first choice. Very soon afterwards after Chapel, instead of going to class, I went back to Francis Brown House, donned my ATC uniform, went to the bike shed, hopped on to my bike, and rode off to the International Harvester Works. I went to the main entry gate, which was heavily guarded, gave the Guard the best salute I could muster and requested an audience with the Commanding Officer? Some minutes later the Guard returned and told me that the Commanding Officer would see me,and that I should follow him. I knew then that I was into something big. I was so excited. As I entered his office I met the Squadron Leader, and gave him the straightest best salute I could possibly muster. He smiled and told me to sit down. Peter Champion de Crespigny (17) at Benalla Airport EFTS 1943 just prior to flying in a Tiger Moth in which he did his first “ground loop”. There were 18 Belman hangars Benalla in 1943 – today there is one. Then came the questions. Why was I here? I told him that, on leaving school, I would be joining the RAAF as a pilot, and asked would I please be able to go flying in the Airspeed Oxfords when they were being test flown. He asked me, did the School know? Did my Parents agree? I couldn’t wait for approval from the School or my Parents. I had to start flying now. I said yes to all questions, wincing in such a way that I was sure he knew .??? He said tomorrow at 10.30 he would be testing an Oxford, and that if I was to arrive at 10.15, I could go flying with him. Of course the next day I was there. 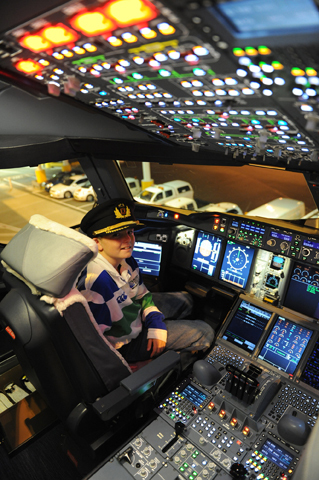 He told me to sit in the left hand seat (the Captain’s seat) as he could teach me better from there. We took off towards the Distillery and climbed away over my School and on to the You Yangs where we did a lot of steep turns. After the required time, we returned to the paddock and he did a superb landing. Any landing would have been superb. I could not believe my excitement and luck. I was doing what I had always dreamed of since flying on one of Sir Charles Kingsford Smith’s three engined planes at the age of 10 years. I learnt to fly at Corio. The most exciting trip was when one day I was told that we would be flying into Laverton Air Force Base to pick up the Spitfire pilot who would be delivering a new Spitfire to the RAAF and would need to be taken back to Corio. Into Laverton! the most tightly protected Airport and here was I, a civilian flying in, in an Oxford. I was sure if I were to be caught I would be shot. On arrival I was told to lie on the floor so no guard would be able to see me. We flew out safely, me in the left hand seat and the Spitfire Pilot sitting on the spar and holding on with both hands. 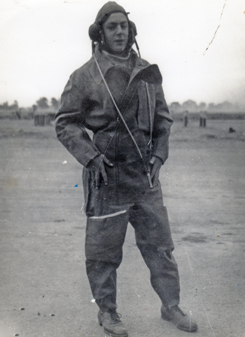 I got up some 15 flying hours in Oxfords until I left School at the end of 1943, to await my call up for the RAAF. After I left school, at home in Ararat with my Parents, lamenting my poor examination results (only achieved a half pass in intermediate Geography) I said in my defence that I had beaten the system at school and told them about all my flying and how wonderful it had all been. And that during all that time, none of the Masters ever found out what I had been doing. My Mother went to her desk and produced a letter from the Head Master of Geelong Grammar who told her all about my flying exploits and at the time suggested that if it was OK by my Father and Mother that it would be fine with the school. Their reasoning was that I should be able to achieve my passion. That passion was to fly. Yes life at Geelong Grammar School during the war years was remarkable. I am indebted to the Late Sir James Ralph Darling, the headmaster of Geelong Grammar, who was a truly wonderful person and a great Educator. Both real close shots of Aerocobres. Possibly the best looking fighter in the world. The engine was immediately behind the Pilot. The drive shaft passed between his legs.!!!!! The aerodrome and Works were later passed over to the RAAF who used the facilities for the same purpose,except the aircraft they assembled were Spitfires, Oxfords (which was where I received my instructional flying) Avro Ansons etc. Airspeed Oxford.Used for training bomber pilots at Service Flying Training School.Taken at Lara field 2 miles from school.Lovely Airplanes which I flew in for night flying and for cross country at very low altitudes.Retractable undercarriage. Beautiful. The Security was more friendly here. 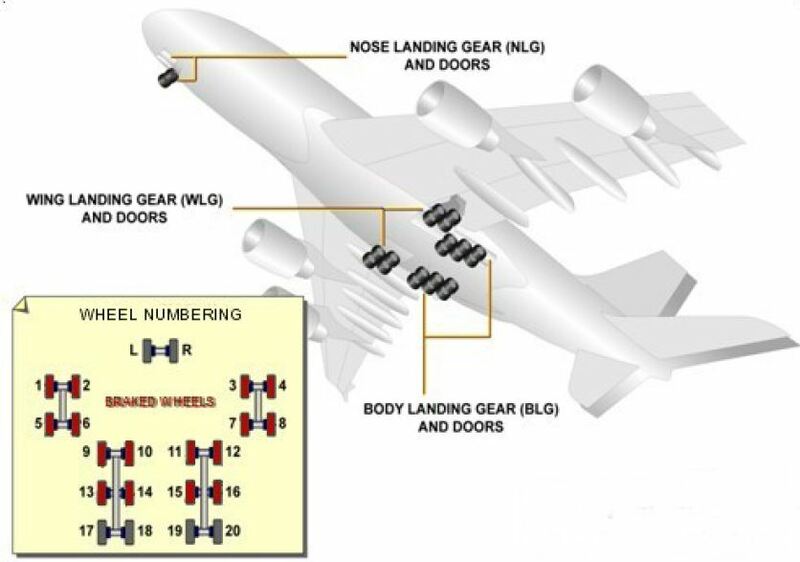 I got access to the entire assembly line and the aircraft. Unbelievable on looking back. My most exciting experience was when we would fly into the RAAF base at Laverton and pick up a Spitfire Pilot and take him back to Corio. 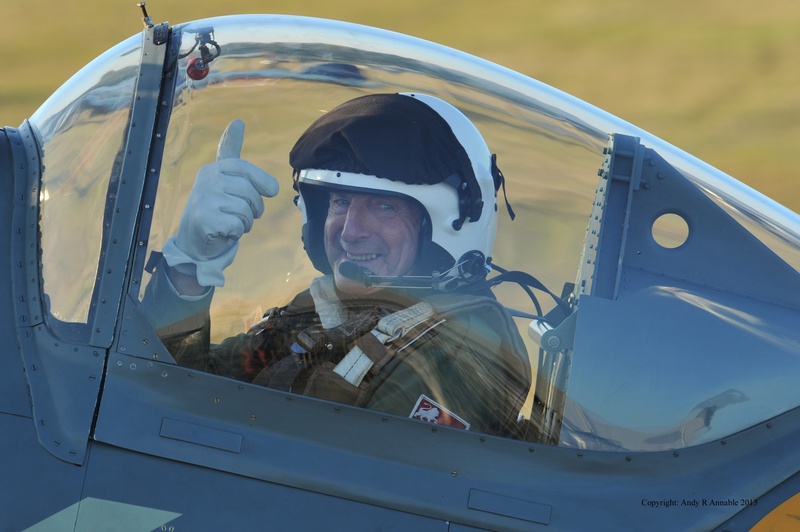 I was a civilian and flying into the most heavily guarded RAAF base was thrilling. I had to keep out of sight after we taxied in. 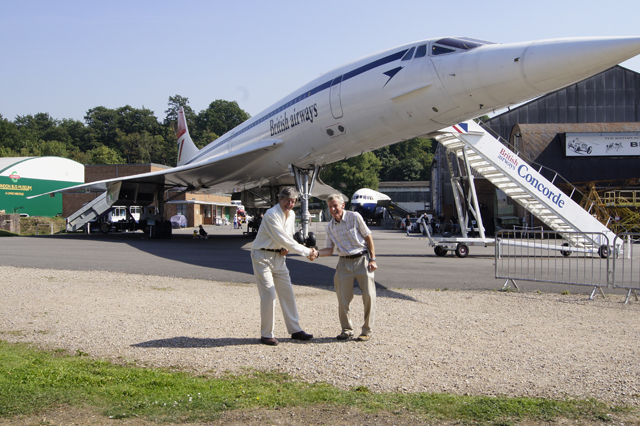 Dad visited Brooklands in September 2013. 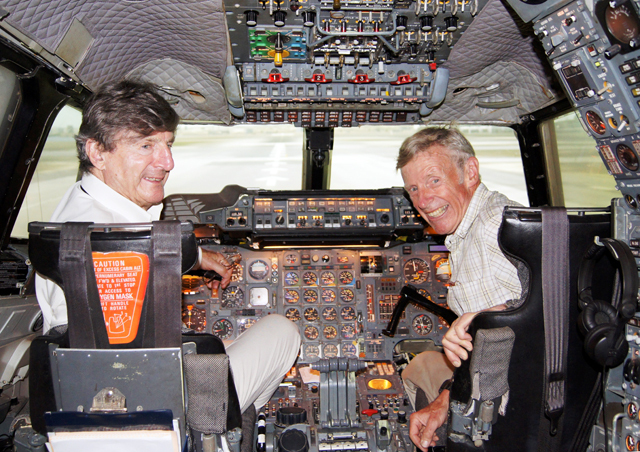 Concorde Captain Christopher Orlebar took dad for a personalised tour of the Concord display aircraft and Concorde Simulator. Spitfires to me are the epitome of everything great in the Flying World. I have idolized the Aeroplane ever since I was a small boy. I made my first of many models at Geelong Grammar when I was just 12 years old. I never dreamt that one day I would be lucky enough to actually go flying in one. Well all that is history, and my flight,in Spitfire Mark 9 KJI SM520 (G-ILDA) in September 2013 was a highlight of my life. 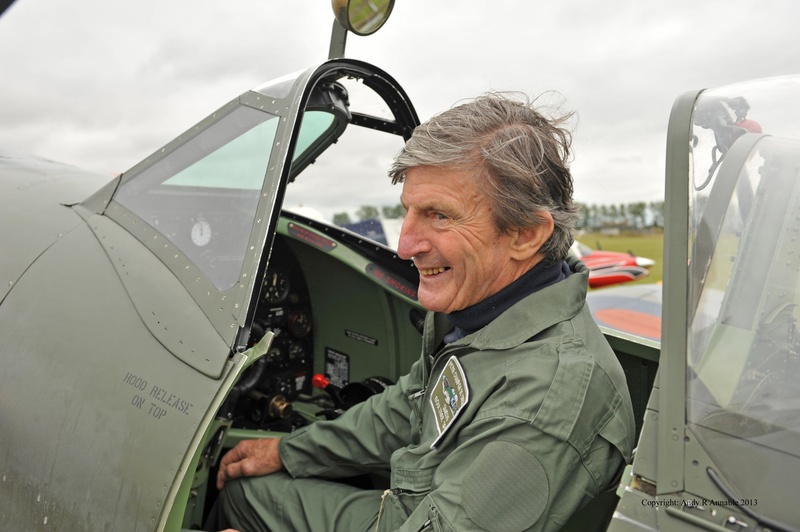 It was made possible by Mr Paul Portelli and his Team of experts at the Boultbee Flight Academy, who have restored G-ILDA this treasure to its original glory and given me my chance to live a dream. I wish to convey my gratitude to Tim, and to Jenny for making all the arrangements, to Richard for the great flight in your Chipmunk, to Chris for the great flight in the Harvard, and to John for the unforgettable flight in Spitfire MK9 G-ILDA and the beautiful Victory Roll in the Spitfire as we returned overhead Brooklands Airport. I was impressed with the wonderful condition of all three aircraft, and the professionalism of the engineers on the ground, making sure that everything was absolutely secure. That’s a fantastic story Richard. Glad your father decided to share it. 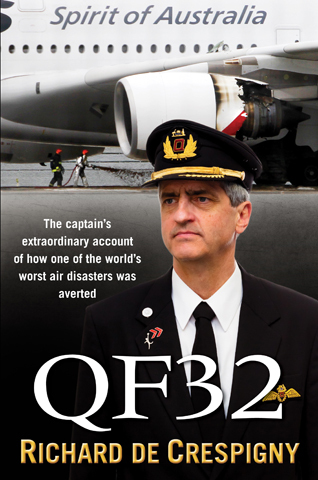 I also enjoyed the QF32 book immensely. Your honesty and frankness throughout the book describing the events was admirable. Although I have had a very small experience in aviation, my career is in IT. I don’t have many mentors throughout my career but have found your approach and professionalism something to aspire to.